The second installment in Mór Games’ epic saga clocks in at a massive 101 pages, 1 page front cover, 2 pages of editorial, 1 page ToC,1 page SRD, 1 page advertisement, 1 page back cover, leaving us with a massive 94 (!!!) pages of content, so let’s take a look, shall we? This being and adventure-review, the following contains SPOILERS. Potential players may wish to jump to the conclusion. After triumphing in the former module, Philiandrius the mage contacts the PCs again to travel to the town Innskittering to reclaim the so-called “Antecedent of Easement” as a first step towards foiling the invasions of the Fomoire and their dread deity. Providing them with a means of contacting him and some scrolls, the PCs are sent on their way toward the town of Safeharbor – provided they can prevent their ship from being sunk by magma elementals. In Safeharbor, the PCs may unwittingly gain the attention of the Sect “The Culling” – people that hunt good clerics and wizards because they want the peace bought from the evil gods to remain intact. Morally interesting, this fascinating nod towards the structure of deities and belief in the Imperiums Campaign Setting makes for a compelling set-up that adds a unique dimension to the setting, but one you can easily ignore or reappropriate. Which also brings me to a point – in case you have not played Plight of the Tuath’s first module, you are not left alone – the module offers ample advice on running this as a stand-alone, though it mho loses some of its glorious fluff if you do so. Advice on additional tricks to challenge exceptionally capable parties also can be found throughout the module, which renders running it for pros (like my players) easier. Now back to the plot – I mentioned the Culling already, and know what – the first killer of them the PCs may encounter actually gets a massive, concisely-written background story and actually is a well rounded character. Now Innskittering, guarded by magical mists, hits a soft spot with me – the sinister village, with its old hagish barkeeper, the module’s eponymous creepy rhyme-song “Vasily’s Woe” and the subtle sense of decreptitude and death, the town and its non-too-friendly inhabitants may well end up as troop-style mobs out for the PC’s blood – after all, the temple the PCs will have to enter is taboo ground for strangers. In the exceeding, cool flavor of the module, the very guardian statues of the temple receive their own legends. Unbeknownst to the PCs, the recent outbreaks of plagues (which, as a backdrop of looming despair, is also reflected in tinctures and long-nosed plague masks as available items to purchase – including a stunning artwork for the mask) has had the despairing villagers transform people into soul-bound marionettes -and the path of breadcrumbs leads to Petrov Manor. In the dark manor, the PCs may save a gnome as they explore the place – now if you’re like me, here’s one final example why this module is such a great read: A small box fills us in on a gnomish custom – the small folk have been hunted by doppelgangers for generations and thus tend to show their “colors” by picking their skin and bleeding, believing doppelganger blood to be of a different color than red. This also influences jewelry, which often comes with a means to picking one’s skin. Now mind you, small cultural tidbits that make sense on a very fundamental logic level within the context of a setting might seem paltry to you, but you *notice* these things on a subconscious level and they all come together. Now, beyond the investigation of the manor, which in its dressing and challenges, remains distinctly medieval (and unlike most haunted manor scenarios ), the PCs can also explore the manor grounds, where a dread cult taken root -or go directly to the witch Yaga Petrov, who makes for essentially the boos of this module – if they manage to survive her unique spells, the demonic infestation and oh so much more. The module also comes with a full-page hand-out of stats for a certain gnome, information on the 4 exceedingly cool emergences the PCs may receive during this module (think of trait-like/spell-like rewards for actions that may be lost…or further explored…), fully detailed and statted villages with legends, properly narrated and phrased galore, 10 magic items with EXCESSIVE background information, 6 original monsters, optional rules for minor and major divine rituals, write-ups for the religions of 4 deities (including rituals, SAMPLE BLESSINGS and subdomains…) and finally, 4 pregens, all with their own full-color artworks. Easy to print-out b/w-cheat cards for DMs to show or have ready for key-NPCs and player-friendly versions of 6 of the maps (all they could conceivably research in the module) are provided. Editing and formatting are top-notch – while e.g. one of the statblocks has a “1” missing before the 6 in the AC-entry, the modifiers remain and that was the most grievous glitch I noticed – for a module of this length, quite impressive. Layout adheres to a 2-column full-color standard that is easy to read…and makes me weep that I don’t have this in print…yet. Seriously, the first “Plight of the Tuath”-module was beautiful, this perhaps is even more so. The artworks are, no hyperbole, on Paizo-level, depending on your tastes, perhaps even beyond it. It should also be noted that the module is internally hyperlinked and excessively bookmarked for your convenience. The cartography is line-drawn and nice – and plentiful. “Vasily’s Woe” is an exercise is great story-telling that even has some sand-boxy, non-linear qualities to it. While, in its heart, a relatively simple investigation/explore spooky places-module, this adventure actually made it hard for me to put it aside. I’m not kidding. I do not often come across a module I want to read to the end, taking my laptop to bed with me after staring all day long at text. William Moomaw’s “Vasily’s Woe” did just that. Where the first module by Mór Games had some slight issues with a potentially overshadowing NPC, some non-standard rules in the climax etc., this one also provides unique rules – but ones that actually make sense within the context of the module, and sans contradicting existing ones. But you don’t necessarily will want to buy this for the crunch. You want to buy this for the atmosphere, the ingenuity of the writing, the mastery of the little cultural tidbits that make a world come alive. The atmosphere can be perhaps described as a captivating blend of Russian and Gaelic myth, dosed with a nice sprinkle of danse macabre, an a coherent world-building that may be based on systems and creatures we know, but gives them a whole new dimension. This is more “The Witcher” than Golarion – grittier, but not necessarily darker. The amount of detail provided for…well, EVERYTHING, steeps everything in a sense of antiquity that utilizes subtle techniques of myth-weaving to create a beautiful tapestry of interconnecting dots PCs and players alike may explore at the same time, generating an (Almost always optional) level of detail scarcely seen in modules. Better yet, the overall panorama drawn here is one I really, really love – while managing to generate a sense of antiquity, of an old and ancient world, at the same time, this module succeeds in being FRESH. This module and its setting, from what I could glean of that, manages to be at once defiantly old-school and suffused with a sense of the ancient and mythological (in the proper academic term’s various notions), while at the same time carving its own identity and making a defiant stand against settings that have bloated themselves with races, thinking that by adding a race with x modifiers, they can create a richer backdrop of cultures, when they can’t even get proper human cultures right. This module has more awareness of what makes a world believable than the vast majority of settings I’ve read (and enjoyed). It boils down to the attention of detail and the proper THINKING THROUGH of its components, which come together as something greater than the sum of its parts. You may have noticed that I have remained relatively opaque throughout the review – this is not due to an inability to describe the plot, but rather from my desire to not spoil this one and the reading experience, this offers. 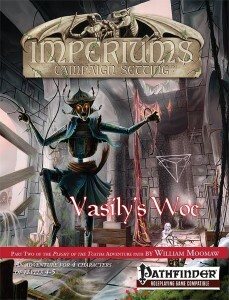 William Moomaw and Mór Games deliver a module, which, while not flawless, makes for a superb reading, a compelling adventure and top-notch production values. Add to that the fact that this is only the second product of Mór Games and I’m really stoked to see where the company and its Imperiums-campaign setting will go in the future. I remain with a final verdict of 5 stars + seal of approval and a nomination as a Candidate for my Top Ten of 2014. You can get this glorious module here on OBS and here on d20pfsrd.com’s shop!